If you're impressed with the reviews and feel you just have to buy these books, please go to the O'Brien website: click here. 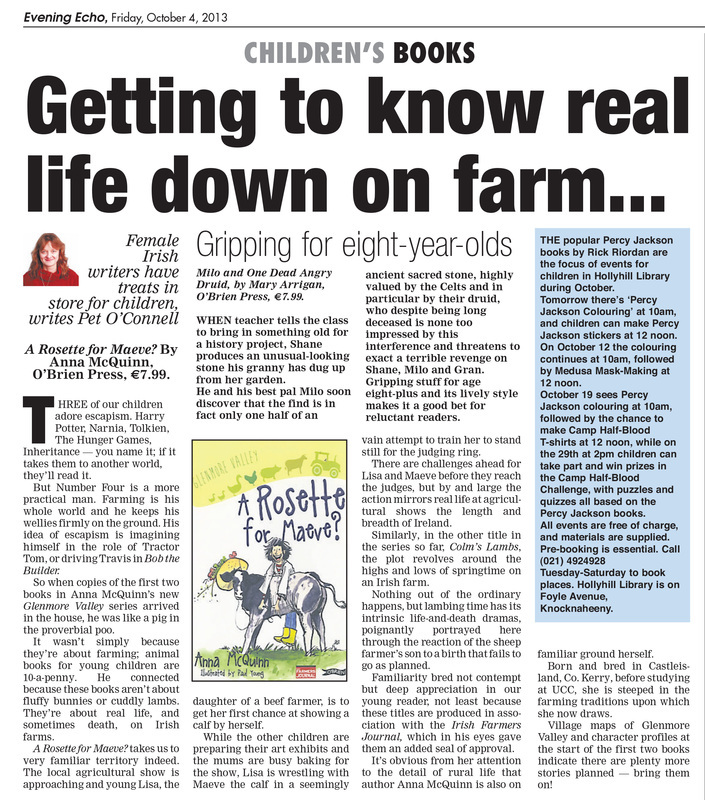 A Rosette for Maeve and Colm’s Lambs by Anna McQuinn Written in association with the Irish Farmers Journal, these two books – set in the fictional Glenmore Valley – offer a glimpse into what life is really like for a child growing up in a small Irish rural community. A Rosette for Maeve tells the story of nine-year-old Lisa O’Sullivan, who lives on a beef farm with her family. When Lisa is given the exciting task of showing a new calf at the Glenmore Valley Show, she has just a few days to learn how to train, groom and handle a Belgian Blue called Maeve, a boisterous bovine who fancies herself as a bit of a supermodel. It’s a sweet, simple tale about how a young girl deals with responsibility and is dotted with educational facts about calves which knowledge-hungry kids will enjoy. While A Rosette for Maeve is light-hearted, Colm’s Lambs has a darker edge. It is lambing season on the O’Connor sheep farm, and eight-year-old Colm is helping his farmer Dad deliver the babies. When one of the lambs dies, Colm remains pragmatic yet pensive, whereas two visiting children from Dublin are utterly distraught at the notion of an animal dying. The reality of farming life is laid more bare in this book – Colm’s Dad is exhausted after pulling lambing all-nighters, and one poor newborn is abandoned by its mother – so it would be a good choice for a child who is bored of sugar-coated stories and fancies something a bit more emotionally challenging. Both books are illustrated with charming watercolours by Paul Young and my three-year-old daughter, while too young to understand the content, really enjoyed looking at the pictures and making up her own story! Boys and girls from the age of six upwards will enjoy the Glenmore Valley series – be they from the country or a city – and will look forward to finding out more about the valley’s other residents, from Geraldine Brosnan the vet to the art-loving Caffrey family who run the local cafe. Suzanne Rose, link to website, here. INIS Magazine - the flagship publication of Children’s Books Ireland. Colm's Lambs: It’s lambing season and life is very busy on the sheep farm where Colm O’Connor lives with his brother, Michael and his mam and dad. Colm loves to help out with lambing. The work is hard and the lambs can come any time, day or night. His friends Molly and Daisy come to visit from the city and they’ve never seen a baby lamb before. But it’s not too long before they get stuck in! The children find a new baby lamb all on its own in the field. They are all going to have to work together to save the lamb. Can they convince one of the sheep to take the lamb as her own? Welcome to the Glenmore Farm series! This is one of two new books that give young readers a view into the world of farming; something that, like Colm’s friends Daisy and Molly, most children don’t get to experience. It’s very clear that author Anna McQuinn knows her subject matter well. The story is well written and clear, depicting farm life with accuracy. The plot develops quickly and holds the interest of the reader. The children populating her story are true to life and well-rounded. The illustrations by Paul Young are contemporary, lively and fresh; adding much charm to the story, without ever becoming ‘twee’. A thoroughly enjoyable story. A Rosette for Maeve? : Lisa O’Sullivan lives on a beef farm with her younger brother, Joe, and her mum and dad. It’s show time in her village and, this year, Lisa has a big challenge ahead of her. Her dad has put Lisa in charge of showing their new Belgian Blue calf, Maeve. This calls for a lot of hard work and dedication on Lisa’s part, because Maeve has a mind of her own. Maeve already thinks she’s a supermodel, and she wanders off on her own and ends up in the fashion tent! Can Lisa ever get Maeve to perform for the judges? Welcome to a new series, Glenmore Valley. One of two recently released stories, this one is utterly delightful. Full of laughs and true-to-life situations, there is plenty of action to hold interest. McQuinn depicts life on a farm with great accuracy and joy, without creating an idealised and unrealistic view. The children are very real, with genuine concerns. As with the other title, Colm’s Lambs, this book allows for a good view of life on the farm, which is something that many children never get to see. Echoing the humour of the text, the illustrations by Paul Young add much to the fascination and enjoyment in this story. A perfect introduction to farm life, if you’re not a farmer, this is also a great and realistic read for children growing up on farms… an area that is frequently overlooked when telling children’s stories. Wonderful. Mary Esther Judy Link to the website, here. This new series from the noted Irish publishers O’Brien is produced in collaboration with the Irish Farmers Journal, and are written by Anna McQuinn with illustrations from Paul Young. The two titles so far available are utterly delightful. Colm’s Lambs introduces us to the village, the farms and the characters who will appear in the stories, and gives readers a good insight to the realities of lambing, while A Rosette for Maeve? follows another farmer’s daughter, Lisa, as she prepares her prize calf for a show. Aimed at older KS1 and lower KS2 readers, well-illustrated, funny and sad at times, these short novels don’t glamorize farming but perfectly express the hard work and enjoyment which farm life offers. They also offer an insight to Irish life, on and off the farm. Brilliant! Forget Harry Potter – welcome to Glenmore Valley, a brand new books series about farming for children. Taking care of lambs and training calves is the order of the day in the new series Glenmore Valley. A wonderful world of fun and informative stories about farming and country life are depicted by author Anna McQuinn and brought to life by illustrator Paul Young. They are a must -read for any young boy or girl who is interested in animals, the countryside and farm life. Colm’s Lambs, by Anna McQuinn and illustrated by Paul Young, tells the story of a newborn lamb that might not survive. I enjoyed reading this book because it’s funny, but at same time sad. I really liked the main character Colm; he is kind and good at farming and looking after lambs. The dad has a good sense of humour, and he is also kind like Colm. However I was not so fond of Daisy and Molly, the cousins, because they are always asking questions! The illustrations are very well done and I learned a lot about the animals.I would read more books in this series, and would recommend this book to others. Overall, I’m giving it 8 out of 10. I liked the starting because it was very good the way they described their calf Maeve and the Glenmore Fair. It had a good ending because they won the red rosette which is 1st place. They had never entered the calf competition before. So it was amazing. It was set in a farm and a fair. Lisa lived with her brother Joe, her mom and dad in Glenmore Valley. Their calf’s name was Maeve. She was a Belgian Blue. I would give this book a score of 10 out of 10. I think this book is for ages 7 and 8. ‘This Week We Love’: A Rosette for Maeve? Best children’s books for Christmas includes A Rosette for Maeve?